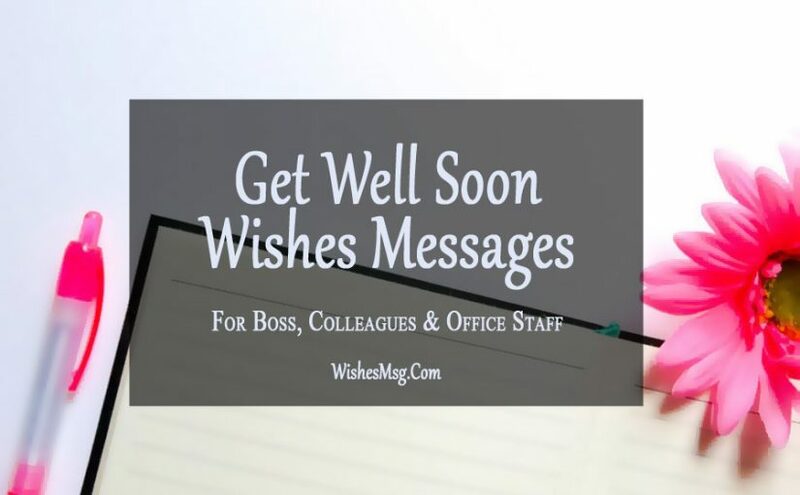 Get Well Soon Messages : There are many types of bosses and colleagues in an office, the always angry one, the funny one, the manipulator, the screamer and so on. But they all have the same thing in common. They all fall sick every now and then. When your boss or coworker is a bit sick and lying on the hospital bed hopelessly, it’s your time to stretch your relationship from a merely professional one to a personal level. No matter how much you may hate your boss, you should wish him a quick recovery. 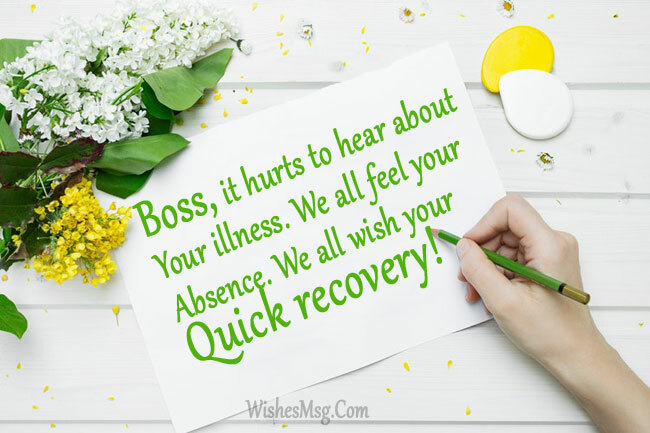 Unlike any other get well soon wishes, you should be more careful while choosing words for sending a get well soon message to your boss. 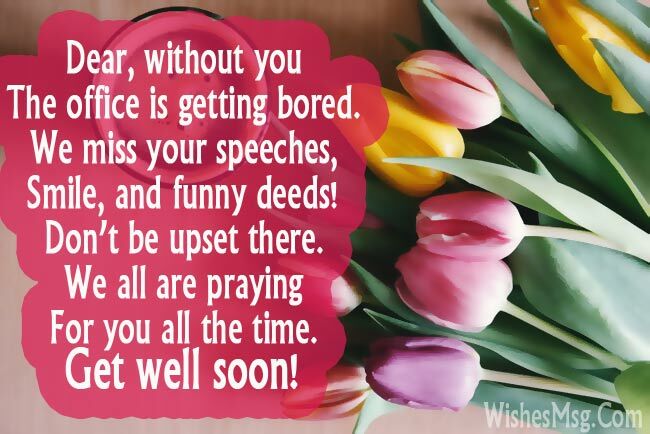 A simple but elegant get well soon message to wish him a quick recovery can really touch his heart and give him the strength he needs right at that moment. Same things apply to your colleagues or coworkers too! So, it’s never too late to show some personal care for your boss, colleagues, co-workers or any of your office staff in the most professional way. Every day when I enter the office and before sitting in my seat I meet you first. The day after it has turned into my habit. But now as you are ill, I miss your presence a lot all the time. Get well soon my dear boss! Dear Boss, you are my icon. I try to follow you in my every work. Without you, the office seems incomplete. Come back soon and wish you a fast recovery! Boss, it hurts to hear about your illness. We all feel your absence. We all wish your quick recovery! Get well soon! I know you are sick but don’t be sad, Dear boss. It is temporary. We all are praying for you all the time. Best wishes to you! You are the best leader and the greatest Boss ever. We know that we need to work hard but without you, it is a little bit difficult. So come back soon, Sir! We are waiting for you. Wish your fast recovery! Dear Boss, I know you are in the hospital and the doctor will release you just in a short time. Don’t be afraid. We all are with you. And you have to come back soon because we need you! Feel better soon, sir! 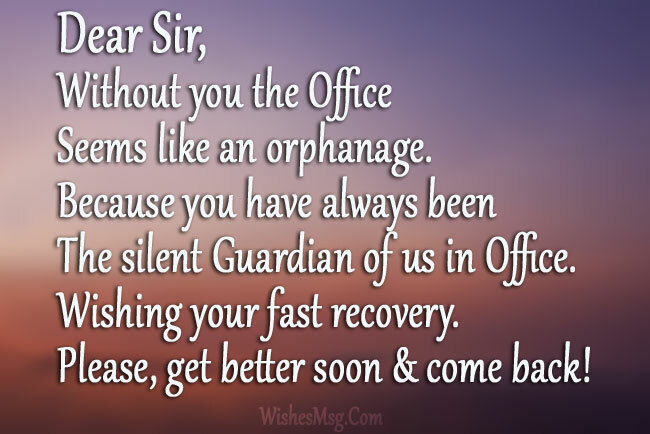 Dear Sir, without you the office seems like an orphanage. Because you have always been the silent guardian of us in office. Wish your fast recovery. Come back soon! You are our true friend, idol, and leader. We miss your presence a lot. Get better soon, sir! Boss, we heard about your illness. Without you, the office has become so boring! 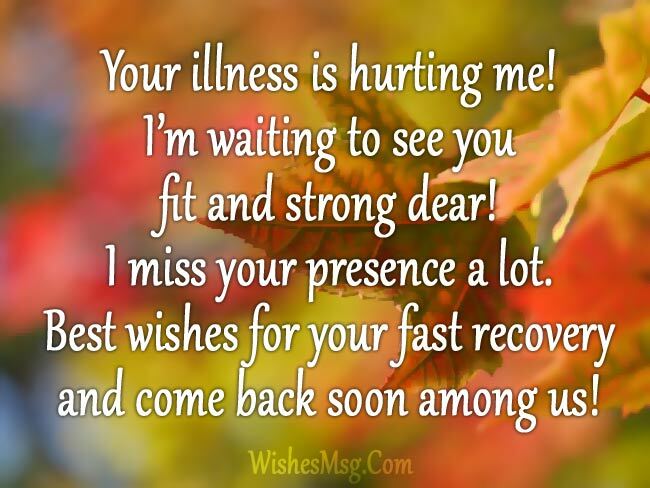 Wishing your fast recovery! 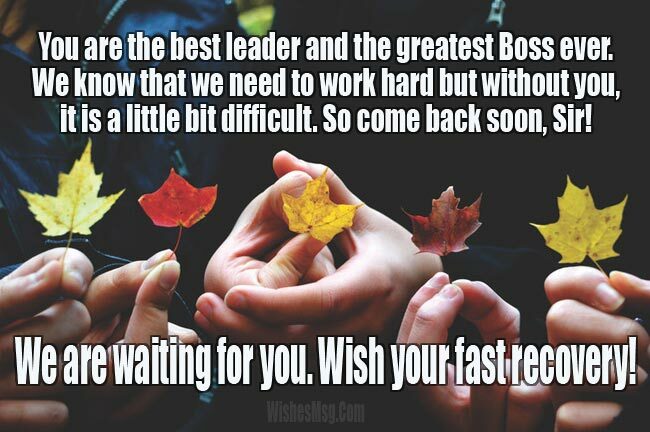 The message is to let you know that I miss your leadership. I miss your presence Boss! Get well soon! Because of your illness now you are in the hospital. For this reason, your family, friends, co-workers can feel your absence. We all are praying for you. I hope you’ll come back soon sir! Dear Boss, without you we are nothing but a boat with no direction! We need you a lot. Come back to us sir! We all love you and miss your presence. Get well soon! Dear friend, your absence in the office means you are just an absent employee for the company, an absent colleague for the others and a missing member of a group. But for me, you are everything that makes office interesting. Get well soon dear! Your illness is hurting me! I’m waiting to see you fit and strong dear! I miss your presence a lot. Best wishes for your fast recovery and come back soon among us! Dear, without you the office is getting bored. We miss your speeches, smile, and funny deeds! Don’t be upset there. We all are praying for you all the time. Get well soon! I wish I could take all your pain. That will not happen! But one thing I can do, that is I can pray to Allah for removing your pain. Don’t worry dear! Our best wishes are always with you! Dear, don’t be sad in this situation, be happy instead. No one likes to fall sick but sometimes sickness is a chance given by Allah to have some rest in this busy life! So, enjoy this break until you feel well. Wish your fast recovery! Get well soon dear! We want to see you as a healthy, happy and smiling person as always! You are in the hospital. Just think it as an off day. We all are praying for you. We hope you will come back soon in the office and after that, we will enjoy our days as we enjoyed before! Get well soon dear! It is said that we never appreciate water until the well become dry. Just like this we never got to admire your presence. But now we can feel your absence a lot. Without you, the office is not same as before. Wish you a fast recovery! There are so many people around me. But among them, I find the one. You are the one to me. You are not only my colleague but also my friend. I miss you a lot. Come back soon in the office! 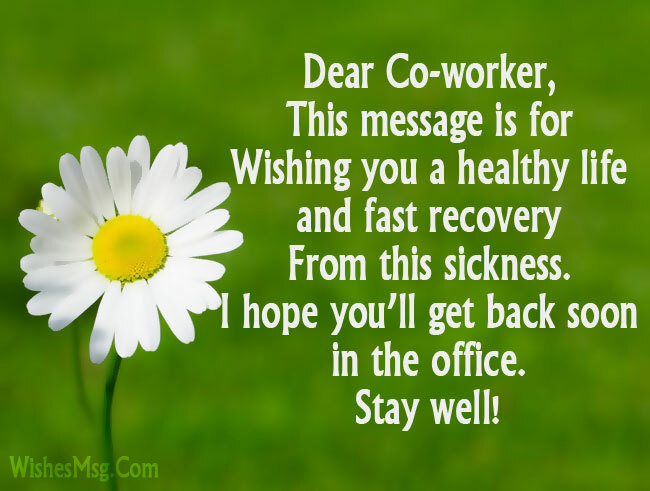 Dear co-worker, this message is for wishing you a healthy life and fast recovery from this sickness. I hope you’ll get back soon in the office. Stay well! I’m getting jealous! Everyone is busy taking care of you. Please don’t make it long. Get back soon dear. By the way, I miss your presence every moment. Recover soon! You are a winner more than a fighter. We have every reason to believe that you will fight the sickness and come back as a winner. Wish your fast and quick recovery dear!